The First Sunday after Trinity, Luke 16:19-31 A Sermon by Martin Luther; taken from his Church Postil, 1522-1523. 1. We have hitherto heard in our Gospel lessons of various examples of faith and of love; for as they all teach faith and love, I hope you are abundantly and sufficiently informed that no human being can be pleasing to God unless he believes and loves. Now in this Gospel text the Lord presents to us at the same time an example of faith and of unbelief or of the state of the godless, in order that we also may abhor the contrary and the opposite of faith and love, and that we may cleave to faith and love more diligently. For here we see the judgment of God upon the believers and the unbelievers, which is both dreadful and comforting. Dreadful to the faithless and comforting to the faithful. But in order that we may the better grasp the meaning of this text we must picture to ourselves both the rich man and poor Lazarus. In the rich man we see the nature of unbelief and in Lazarus the nature of belief. PART I. THE RICH MAN. 2. We must not view the rich man according to his outward conduct; for he is in sheep's clothing, his life glitters and shines beautifully, while he tactfully conceals the wolf. For this Gospel text does not accuse him of adultery, of murder, or robbery, of violence or of having done anything that the world or reason would censure. Yea, he has been as honorable and respectable in his life as that Pharisee who fasted twice a week and was not as other men, of whom Luke 18:11f. speaks. For had he committed such glaring sins the Gospel would have mentioned them since it examines him so particularly that it describes even the purple robe he wore and the food he ate, which are only external matters and God does not judge according to them. Therefore he must have led outwardly an exemplary, holy life; and according to his own opinion and that of others, he must have kept the whole law of Moses. 3. But we must look into his heart and judge his spirit. For the Gospel has penetrating eyes and sees deep into the secret recesses of the soul; reproves also the works which reason cannot reprove, and looks not at the sheep's clothing, but at the true fruit of the tree to learn whether it is good or not, as the Lord teaches in Mat. 7:17. Hence if we judge this rich man according to the fruits of faith, we will find a heart and a tree of unbelief. For the Gospel chastises him that he fares sumptuously every day and clothes himself so richly, which reason never considers as especially great sins. Besides, the work-righteous people think it is right, and that they are worthy of it, and have merited it by virtue of their holy lives, and they do not see how they thus sin by their unbelief. 4. For this rich man is not punished because he indulged in sumptuous fare and fine clothes; since many saints, kings and queens in ancient times wore costly apparel, as Solomon, Esther, David, Daniel and others; but because his heart was attached to them. sought them, trusted in and chose them, and because he found in them all his joy, delight and pleasure; and made them in fact his idols. This Christ indicates by the words "every day," that he lived thus sumptuously daily, continuously. From this is seen that he diligently sought and chose such a life, was not forced to it nor was he in it by accident, or because of his office or to serve his neighbor; but he only thereby gratified his own lust, and lived to himself and served only himself. 5. Here one traces the secret sins of his heart as the evil fruit. For where faith is, there is no anxiety for fine clothing and sumptuous feasting, yea, there is no longing for riches, honor, pleasure, influence and all that is not God himself; but there is a seeking and a striving for and a cleaving to nothing except to God, the highest good alone; it is the same to him whether his food be dainty or plain, whether his clothing be fine or homespun. For although they even do wear costly clothes, possess great influence and honor, yet they esteem none of these things; but are forced to them, or come to them by accident, or they are compelled to use them in the service of others. Thus queen Esther says, that she bore the royal crown against her will, and that she had to wear it for the sake of the King. David also would rather have lived a private life; but for the sake of God and of his people he had to become king. In like manner all the saints considered that they were constrained to fill their stations of influence, honor and glory; and their hearts were never entangled by them, and labored in these external things to be helpful to their neighbor, as Psalm 62:10 says: "Trust not in oppression and become not vain in robbery; if riches increase set not your heart thereon." 6. But where unbelief reigns man is absorbed by these vanities, be cleaves to them, seeks them and has no rest until he has acquired them, and after he possesses them, he feeds and fattens himself with them as the swine wallow in the mire, and finds at the same time his happiness and felicity there. He never inquires how his heart stands with his God and what he possesses in God and may expect from him; but his belly is his God; and if he cannot get what he wants, he imagines things are going wrong. And lo, these dreadful and wicked fruits of unbelief the rich man does not see, he covers them over, and blinds his own eyes by the good works of his pharisaical life, and hardens himself until no teaching, exhortation, threatening nor promise can help him. Behold, this is the secret sin which today's Gospel punishes and condemns. 7. From this now follows the other sin, that he forgets to exercise love toward his neighbor; for there he lets poor Lazarus lie at his door, and offers him not the least assistance. And if he had not wished to help him personally, he should have commanded his servants to take him in and care for him. It may have been, he knew nothing of God and had never experienced his goodness. For whoever feels the goodness of God, feels also for the misfortune of his neighbor; but whoever is not conscious of the goodness of God, sympathizes not in the misfortune of his neighbor. Therefore as he has no pleasure in God, he has no heart for his neighbor. 8. For the nature of faith is that it expects all good from God, and relies only on God. For from this faith man knows God, how he is good and gracious, that by reason of such knowledge his heart becomes so tender and merciful, that he wishes cheerfully to do to every one, as he experiences God has done to him. Therefore he breaks forth with love and serves his neighbor out of his whole heart, with his body and life, with his means and honor, with his soul and spirit, and makes him partaker of all he has, just like God did to him. Therefore he does not look after the healthy, the high, the strong, the rich, the noble, the holy persons, who do not need his care; but he looks after the sick, the weak, the poor, the despised, the sinful people, to whom he can be of benefit, and among whom he can exercise his tender heart, and do to them as God has done to him. 9. But the nature of unbelief is that it does not expect any good from God. By which unbelief the heart is blinded so that it neither feels nor knows how good and gracious God is; but as Psalm 14:2 says: he cares not for God, seeks not after him. Out of this blindness follows further that his heart becomes so hard, obdurate and unmerciful that he has no desire to do a kindness to his fellow man; yea, he would rather harm and offend everybody. For as he is insensible to the goodness of God, so he takes no pleasure in doing good to his neighbor. Consequently it follows that he does not look after the sick, poor and despised people, to whom he could and should be helpful and profitable; but he casts his eyes upward and sees only the high, rich and influential, from whom be himself may receive advantage, gain, pleasure and honor. 10. So we see now in the example of the rich man that it is impossible to love, where no faith exists, and impossible to believe, where there is no love; for both will and must be together, so that a believer loves everybody and serves everybody; but an unbeliever at heart is an enemy of everybody and wishes to be served by every person and yet he covers all such horrible, perverted sins with the little show of his hypocritical works as with a sheep's skin; just as that large bird, the ostrich, which is so stupid that when it sticks its head into a bush, it thinks its entire body is concealed. Yea, here you see that there is nothing blinder and more unmerciful than unbelief. For here the dogs, the most irascible animals, are more merciful to poor Lazarus than this rich man, and they recognize the need of the poor man and lick his sores; while the obdurate, blinded hypocrite is so hard hearted that he does not wish him to have the crumbs that fell from his table. 11. Now all unbelieving people are like this rich hypocrite. Unbelief cannot do nor be different than this rich man is pictured and set forth by his life. And especially is this the character of the clergy, as we see before our eyes, who never do a truly good work, but only seek a good time, never serving nor profiting any one; but reversing the order they want everybody to serve them. Like harpies they only claw everything into their own pockets; and like the old adage runs they "rob the poor of his purse." They are not moved in the least by the poverty of others. And although some have not expensive food and raiment, yet they do not lack will power and the spirit of action; for they imitate the rich, the princes and the lords, and do many hypocritically good works by founding institutions and building churches, with which they conceal the great rogue, the wolf of unbelief; so that they become obdurate and hardened and are of no use to anybody. These are the rich man. 12. Likewise we must not judge poor Lazarus in his sores, poverty and anxiety, according to his outward appearance. For many persons suffer from affliction and want, and yet they gain nothing by it; for example King Herod suffered a great affliction, as is related in Acts 12:23; but afterwards he did not have it better before God on account of it. Poverty and suffering make no one acceptable to God; but, whoever is first acceptable to God, his poverty and suffering are precious in the eyes of God, as Ps. 116:15 says: "Precious in the sight of Jehovah is the death of his saints." 13. Thus we must look into the heart of Lazarus also, and seek the treasure which made his sores so precious. That was surely his faith and love; for without faith it is impossible to please God, as the author of the Epistle to the Hebrews says, 11:6. Therefore his heart also must have confessed that he even in the midst of such poverty and misery expected all good from God, and comfortably relied upon him; with whose blessings and grace he was so richly satisfied, and had such pleasure in them, that he would have heartily and willingly suffered even more misery, if the will of his gracious God had so determined. See, that is a true, living faith, which softened his heart by the knowledge of the divine goodness; so that nothing was too heavy or too much to suffer and to do. So clever and skilful does faith make the heart, when it experiences the grace of God. 14. From this faith follows now another virtue, namely, love to one's neighbor, so that he is willing and ready to serve everybody; but since Lazarus is poor and in misery himself, he had nothing with which he could serve others; therefore his good will is taken for the deed. 15. But this lack of service in temporal things he abundantly makes good by his services in things spiritual. For even now, long after his death, he serves the whole world with his sores, hunger and misery. His bodily hunger feeds our spiritual hunger; his bodily nakedness clothes (or feeds, as some editions read) our spiritual nakedness; his bodily sores heal our spiritual sores; in this way he teaches and comforts us by his example, how God is pleased with us, when we are not prosperous here upon the earth, if we believe; and warns us how God is angry with us, even if we are prosperous in our unbelief; just as God had pleasure in Lazarus in his misery, and was displeased with the rich man. 16. Tell me, what king could have rendered a service to the whole world with his possessions, like poor Lazarus has done with his sores, hunger and poverty? Oh, the wonderful works and judgments of God! In what a masterly manner he puts to shame the cunning goddess and fool of this world, namely, reason and worldly wisdom! She stalks abroad and fixes her eyes rather upon the beautiful purple of the rich man, than upon the wounds of poor Lazarus; she would rather center her eyes upon a healthy, handsome person, as this rich man was, than upon a revolting and naked person like Lazarus; yea, she holds her nose before the stench of his wounds and turns her eyes from his nakedness. Thus the great goddess and fool of this world overlooks God in the very presence of such a noble treasure, and always quietly passes her own judgment, and at the same time makes this poor person so precious and dear, that all the kings hence are not worthy to serve him or to dress his sores. For what king, do you think, would not now with his whole heart exchange his health, purple and crown for the sores, poverty and misery of poor Lazarus, if it were possible for him to do so? And what person is there who would now give a snuff for the purple and all the riches of this rich man? 17. Do you not think that this rich man himself, had he not been so blind and had known that such a treasure, a man so precious in the eyes of God, was dying at his gate, would have run out, and dressed and kissed his sores, and laid him in his best bed; and made all his purple and riches to serve him? But at the time God's judgment went forth, he did not see that he could do it. Then God thought, truly, you are not worthy to serve him. When later the judgment and work of God were accomplished, the wise fool begins to come to himself; and since he suffers now in hell he will gladly give his house and land, to whom before he would not give a crumb of bread; and wishes now that Lazarus might cool his tongue with the tips of his fingers, whom before he would not touch. 18. Behold, even at the present day God is filling the world with such judgments and works, but no one sees it; yea, everybody despises it. There are continually before our eyes poor and needy persons, whom God lays before us as the greatest treasures; but we close our eyes to them, and see not what God does there; later, when God has done his work, and we have neglected the treasure, then we hasten and wish to serve, but we waited too long. Then we begin and make sacred relics of their garments, shoes and furniture, and make pilgrimages to and erect churches over their graves, are occupied with many like foolish deeds and thus ridicule ourselves in that we permit the living saints to be trodden under our feet and to perish, and we worship their garments, which is neither necessary nor of any use; so that indeed our Lord will let the judgment fall as he did in Mat. 23:29-33, and say: "Woe unto you, scribes and Pharisees, hypocrites! for ye build the sepulchres of the prophets, and garnish the tombs of the righteous, and say, If we had been in the days of our fathers, we should not have been partakers with them in the blood of the prophets. Wherefore ye witness to yourselves, that ye are sons of them that slew the prophets. Fill ye up then the measure of your fathers. Ye serpents, ye offspring of vipers, how shall ye escape the judgment of hell?" 19. All believers are like poor Lazarus; and every believer is a true Lazarus, for he is of the same faith, mind and will, as Lazarus. And whoever will not be a Lazarus, will surely have his portion with the rich glutton in the flames of hell. For we all must like Lazarus trust in God, surrender ourselves to him to work in us according to his own good pleasure, and be ready to serve all men. And although we all do not suffer from such sores and poverty, yet the same mind and will must be in us, that were in Lazarus, cheerfully to bear such things, wherever God wills it. 20. For such poverty of spirit may exist in those who have very great possessions; as Job, David, Abraham were poor and rich. For David in Ps. 39:12 says: "I am a stranger with thee, a sojourner, as all my fathers were." How could that be, since he was a king and possessed extensive lands and large cities? Thus it came about; although he indeed possessed these, yet his heart did not cleave to them, and they were as nothing compared with the riches he had with God. Likewise he had said of the health of his body that it was as nothing compared to the health of his soul before God, and he would indeed not have murmured, had God afflicted him with bodily sores and sickness. So Abraham also, although he had not the poverty and affliction of Lazarus, yet he had the mind and will to bear what Lazarus did, if God had visited him thus. For the saints should have one and the same inner mind and spirit, but they cannot have the same outward work and suffering. Therefore Abraham also recognized Lazarus as one of his own and received him into his bosom; which he would not have done, were he not of the same mind and had he not taken pleasure in the poverty and maladies of Lazarus. Thus is set forth the sum and meaning of the Gospel, that we may see, how faith everywhere saves and unbelief condemns. 21. This Gospel lesson suggests several questions. First, what is the bosom of Abraham, since it cannot be a natural bosom that is meant? To answer this, it is necessary to know that the soul or Spirit of man has no rest or place where it may abide, except the Word of God, until he comes at the last day to the clear vision of God. Therefore we conclude that the bosom of Abraham signifies nothing else than the Word of God, where Christ was promised, Gen. 22:18, to Abraham, namely: "In thy seed shall all the nations of the earth be blessed." In these words Christ is promised to him, as the one through whom every person shall be blessed, that is, shall be delivered from sin, death and hell, and through no one else and through no other work. All who have believed this passage, have believed on Christ, and have become good Christians, and have also through faith in this Word been released from sin, death and hell. 22. Thus were all the fathers before the birth of Christ carried into Abraham's bosom; that is, at their death they were established in this saying of God, and they fell asleep in the same, they were embraced and guarded as in a bosom, and sleep there until the day of judgment; excepting those who have already risen with Christ, as Mat. 27:5.9 teaches, where they also remained. In like manner we, when we face death, must lay hold of and trust in the Word of Christ with strong faith, as John 11:26 says: "Whosoever believeth on me shall never die," or like passages; and thus die in this faith, fall asleep, be embraced and guarded in the bosom of Abraham until the day of judgment. For the word spoken to Abraham and the word spoken to us is the very same word; both speak of Christ, that we must be saved through him. But the former is more particularly called Abraham's bosom, because it was spoken first to Abraham and began with him. 23. Likewise on the other hand the hell here mentioned cannot be the true hell that will begin on the day of judgment. For the corpse of the rich man is without doubt not in hell, but buried in the earth; it must however be a place where the soul can be and has no peace, and it cannot be corporal. Therefore it seems to me, this hell is the conscience, which is without faith and without the Word of God, in which the soul is buried and held until the day of judgment, when they are cast down body and soul into the true and real hell. For just as Abraham's bosom is God's Word, in which believers rest through faith, and fall asleep and are guarded there until the day of judgment; so must that on the contrary ever be hell, where God's Word is not, into which the unbelievers are cast until the day of judgment. That can be nothing else than an empty, unbelieving, sinful, and evil conscience. 24. The second question is: How then did Abraham and the rich man converse with one another? Answer: It could not have been a conversation with the natural voice, since the bodies of both were lying in their graves; likewise as little was it the natural tongue that complained of being tormented; nor was it natural fingers and natural water that were desired from Lazarus. Therefore this all must be in the conscience thus: When the conscience is awakened by death or by the agonies of death, then it will have a testimony of its unbelief and will see then for the first time the bosom of Abraham, and those embraced by it, that is, the Word of God, in which it should have believed and did not; from which it has the very greatest pain and anxiety as in hell, and finds neither help nor consolation. 25. Then thoughts arise in the conscience, which held such a conversation, if they could speak, as this rich man did with Abraham, and seeks then whether the Word of God, and all who have believed in it, would help; and with so much anxiety that it would receive the least comfort from the very meanest of men, but even that cannot be granted to him. Then Abraham answered him, that is, his conscience took such a view of the Word of God, that it cannot be; but he had his portion of good things in his life, and he must now suffer; while the others are comforted, whom he despised. 26. At last he feels, that it is declared unto him: There is a great gulf fixed between him and the believers, that they will never be able to come together. These are the thoughts of despair, when the conscience feels that the Word of God is withdrawn forever from him; accordingly the thoughts of his conscience rage and would gladly have the living to know that such are the agonies of death, and he craves that someone would tell it to them. But it is to no purpose; for be feels an answer in his own conscience, that Moses and the prophets are sufficient, whom they ought to believe, as he himself should have done. All such thoughts pass between the condemned conscience and the Word of God, in the hour of death or in the agonies of death; and no one can perceive what it is, except the one who experiences it; and he who experienced it wished that others should know it, but all is in vain. 27. The third question is: When did that take place, and if the rich man still daily without ceasing suffers thus until the day of judgment? That is a subtle question and not easily answered to the inexperienced. For here one must banish the idea of time from the mind and know that in the other world there is neither time nor hours, but all is an eternal moment or wink of the eye; as 2 Peter 3:8 says: "A day is with the Lord as a thousand years and a thousand years as one day," Ps. 90:4. Therefore it seems to me that in this rich man we have an example of the future of all unbelievers, when their eyes are opened by death and its agonies; which can endure but for a moment and then cease until the day of judgment, as it may please God; for here no definite rule can be established. Therefore I dare not say that the rich man suffers still at present as he suffered at that time; and I dare not deny that he still suffers thus; for both depend upon the will of God. It is sufficient for us to know that his example and the beginning of the suffering of all unbelievers are here clearly set before us. dead; therefore no one sins by not praying for them; for what God does not bid or forbid us to do, in that no one can sin. Yet, on the other hand, since God has not permitted us to know, how it is with the souls of the departed and we must continue uninformed, as to how he deals with them, we will not and cannot restrain them, nor count it as sin, if they pray for the dead. For we are ever certain from the Gospel, that many have been raised from the dead, who, we must confess, did not receive nor did they have their final sentence; and likewise we are not assured of any other, that he has his final sentence. 29. Now since it is uncertain and no one knows, whether final judgment has been passed upon these souls, it is not sin if you pray for them; but in this way, that you let it rest in uncertainty and speak thus: Dear God, if the departed souls be in a state that they may yet be helped, then I pray that thou wouldst be gracious. And when you have thus prayed once or twice, then let it be sufficient and commend them unto God. For God has promised that when we pray to him for anything he would hear us. Therefore when you have prayed once or twice, you should believe that your prayer is answered, and there let it rest, lest you tempt God and mistrust him. 30. But that we should institute masses, vigils and prayers to be repeated forever for the dead every year, as if God had not heard us the year before, is the work of Satan and is death itself, where God is mocked by unbelief, and such prayers are nothing but blasphemy of God. Therefore take warning and turn from these practices. God is not moved by these anniversary ceremonies, but by the prayer of the heart, of devotion and of faith; that will help the departed souls if anything will. Vigils, masses, indeed help the bellies of the priests, monks and nuns, but departed souls are not helped by them and God is thus mocked. 31. However, if you have in your house a spook or ghost, who pretends that the departed can be helped by saying masses, You should be fully persuaded that it is the work of Satan. No soul has yet since the beginning of the world reappeared on the earth, and it is not God's will that it should be so. For here in this Gospel you see that Abraham declares that no one can be sent from the dead to teach the living; but he points them to the Word of God in the Scriptures, Deut. 31: "They have Moses and the Prophets; let them hear them." By these words Abraham turns to the command of God in Deut. 18:11, where God says: "Thou shalt not be a consulter with a familiar spirit." Is. 8:19. Therefore it is surely nothing but the contrivance of Satan that any spirits should let themselves be entreated and that they should require so and so many masses, such and such pilgrimages or other works, and appear afterwards in the clear light and pretend that certain persons are saved. In this way Satan has introduced error so that the people have fallen from faith into works, and think their deeds may accomplish such great things. And thus is fulfilled what St. Paul declared in 2 Thess. 2:10-11, that God would send upon them powerful error, and temptation to unrighteousness, because they have not received the love of the truth that they might be saved. 32. Therefore be prudent and know that God will not let us know how it is with the dead, so that faith may retain its place in the Word of God, which believes that God will save the believers after this life and condemn the unbelievers. If now a familiar spirit present itself before you, take no notice of it; but be assured that it is the devil, and conquer him with this Saying of Abraham, "They have Moses and the prophets," and likewise with the command in Moses, "Thou shalt not be a consulter with a familiar spirit;" then he will soon be gone. If he leave you not, then let him make a noise until he is tired, and in firm faith suffer his wantonness. 33. And if it were possible that it were indeed a departed soul or a good spirit even, then you should neither learn nor inquire anything of him, since God has forbidden you to do so; because he has sent his Son himself to teach us all that is necessary for us to know. What he has not taught us, that we should gladly not wish to know, and be satisfied with the teachings of the holy Apostles, in which he is preached to us. However, I have further written on this subject in the Postils on the Gospel for Epiphany and in my booklet on the Misuse of the Mass; where you may read more along this line. 34. Likewise, to give an example, we read in the Historia Tripartita (A History in Three Parts) of a bishop, who came to Corinth where he had come to attend a Council, and as he could not find a suitable lodging for himself and his attendants, he saw a house unoccupied and condemned as uninhabitable, and he asked if he might not be allowed to occupy it. Then they told him in reply that it was infested with nightly ghosts, that no one could live in it, and often people were found dead in it in the morning. Then the bishop said but little and immediately entered and lodged there the same night, for he very well saw that the devil was the author of all these ghost stories, and as he had firm faith that Christ was Lord over Satan, therefore he was not moved by his stratagems and he entered to lodge with him. And thus that house was made free by the prayers and presence of a holy man from infesting ghosts and horrifying spectres. Behold, you see that the ghosts are Satan, and there is little use to dispute with them; but one should despise them with a cheerful spirit as nothing. 35. A similar story we read about Gregory, the Bishop of Cappadocia, that he crossed the Alps and lodged with a heathen sexton or clerk of the church, who had an idol, that answered him the questions he asked; and he made his living by telling the people secret things. Now the bishop knew nothing of this, and proceeded the next day as soon as it was morning on his journey. But Satan or the evil spirit could not endure the prayers and presence of the holy man, and at once he betook himself out of the house, so that the heathen sexton could no longer receive answers as before. As soon as he felt his great loss, he set up a great howl to call back his idol, which appeared to him while he was asleep, and said, it was his own fault because he had lodged the bishop, with whom he (the evil spirit) could not remain. The sexton hastened to overtake the bishop and complained to him that he had taken his god and livelihood, and returned evil for the kindness extended to him. 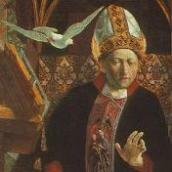 Then the bishop took paper out of his pocket and wrote these few words: "Gregory sendeth greetings to Apollinius. Be thou at liberty, 0, Apollinius, to do as thou hast done before. Farewell." The sexton took the letter and laid it by the side of his idol; then the devil came again, and did as before. Finally the sexton began to think, what a poor god is he, who allows himself to be driven away and lead by my guest who was only a man. And at once he started to the bishop, was instructed and baptized, and grew in his faith, so that he became the eminent bishop of Caesarea, a city in Cappadocia, upon the death of the bishop that baptized him. Behold, how simply faith proceeds, and acts joyfully, securely and effectively. Treat all your troublesome evil spirits in the same way.